The DT-2 is a compact, high-speed drill and tap machine with full milling capabilities. A powerful BT30 taper inline direct-drive spindle provides 12,000 rpm, and allows rigid tapping at speeds to 5000 rpm. A high-speed, 20-pocket tool changer swaps tools quickly, while 2400 ipm rapids and high acceleration rates shorten cycle times and reduce non-cutting time. The DT-2 offers the same lean-style performance and benefits as the DT-1, while providing more X-axis travel and a longer table to handle larger work. With 10% down your estimated monthly payment would be $1,097.00 for a DT-2 machine! With 10% down your estimated monthly payment would be $1,308.00 for a VF-2SS machine! The VF-3YT/50 provides the heavy cutting capacity of a 50-taper machine in a mid-size footprint. It has 6" more Y-axis travel than the standard VF-3. A larger base casting provides the extended Y-axis travel, yet the machine’s footprint is only slightly larger than the standard VF-3. Heavy cast-iron construction yields the rigidity and stability necessary for heavy cutting, and the wide T-slot table provides plenty of room for fixturing and large parts. The Haas high-performance Super-Speed vertical machining centers provide the high spindle speeds, fast rapids, and quick tool changes necessary for high-volume production and reduced cycle times. Each SS machine features a 12,000-rpm, inline direct-drive spindle, an ultra-fast side-mount tool changer, and high-speed rapids on all axes. The VF-4SS is our best selling medium-sized VMC – the perfect high-production workhorse. The TL Series Toolroom Lathes are affordable, easy to use, and offer the precision control and flexibility of the Haas CNC system. The TL-1 is very easy to learn and operate – even without knowing G-code. It is the perfect machine for start-up shops, or as a first step into CNC machining. 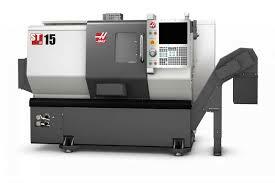 The ST-15 is an extra-small footprint, big-bore lathe that provides a generous work envelope. This machine offers the best performance for the money – the best value – in its class. 5C Collet Servo Rotary Head with Manual Collet Closer. Requires Haas mill with 4th-axis drive for full 4th-axis operation, or a rotary control box for stand-alone operation. Want to cut your cycle time? Haas Automation offers the HRC series rotary tables for customers who need complete parts in less time. HRC rotaries are made with a roller cam design, allowing for high indexing speeds and resulting in lower cycles times. Stock machines may have options that need to be quoted. All machines are FOB Factory unless otherwise stated. You can also visit Haascnc to see the complete line of Haas products including pricing.